The mashed potatoes make these rolls light as a feather. They are easy because you don't have to knead them and you can make them up to a day before you need them--baking them right before you want to serve them. In large bowl combine 2 cups of the flour and the yeast. In small mixing bowl combine warm water, potatoes, butter, sugar and salt. Add to dry ingredients in mixing bowl. Beat with electric mixer for 30 seconds on low, scraping side of bowl. Beat on high speed for 3 minutes. Stir in remaining flour with a dough hook (or knead by hand), as needed (with most bread recipes the actual amount of flour required depends on humidity, etc. so add slowly until dough pulls away from sides of pan and forms a ball). Turn out on lightly floured surface. Shape dough into 24 rolls. I divide by cutting dough piece in half and then each of those pieces in half--continuing until I have 24 pieces. That helps to get a more uniform size. Make balls by holding dough in both hands and gently smoothing by pushing the edges towards the back. 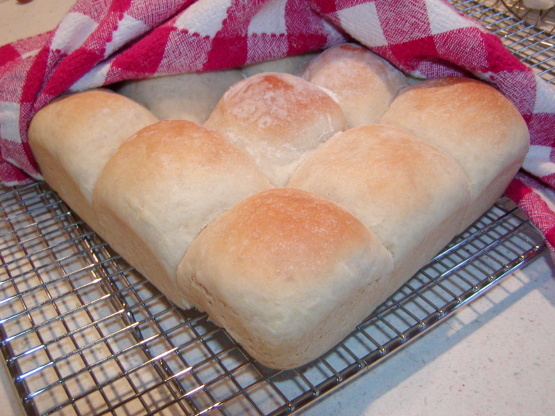 Place rolls in prepared pan. Cover and let rise in a warm place until nearly doubled in size (about 40 minutes). Bake at 400°F for 16 to 20 minutes or until golden brown.